E: I love Thai curries. They are really one of my favourite foods to make when I’m really busy because 1) they aren’t difficult, 2) they are delicious, 3) they can be made in sizable quantities, and 4) I seem to be able to eat curry for several days and still be nowhere near getting tired of it. It is surprising, given that, that I have only recently started making curry paste myself–and also that it has taken me a good month or so to get this recipe up on the web. True, it takes a little more time to make your own paste, but you really get to control the ingredients yourself (hence, no preservatives), and over time you can form it to your own tastes so it really becomes a personal touch to your food. And though it isn’t as easy as digging into a bottle of pre-made, making it yourself need not be as complicated as this recipe. With just some chilies, ginger, garlic, and some cumin you’ll have something quite tasty (I threw together some for a curry last night, off the top of my head, and my only additions to that list were a pinch of coriander, a pinch of cardamom, and a pinch of dried lemongrass). The results were unique in my experience, and so I provide this recipe, if you choose to be so bold as to try it, so you too can create this strange and interesting twist on curry. A few notes before we begin: I will start this recipe with the instructions for the curry paste I made, of which I used slightly-less-than-half in this recipe. I would suggest, for anyone following in my footsteps, you actually use more than that. Even up to the full cup, if you like things really spicy. Why? Because the cauliflower really dilutes the flavors, and with the amount I put in the dish honestly ended up being a bit bland. Also, I served this dish with rice, but what I discovered is that it really is its own rice. The cauliflower adds enough of a starchy, rice-like body to the dish that I really think rice is rendered rather redundant (and there’s your dose of alliteration for the day). 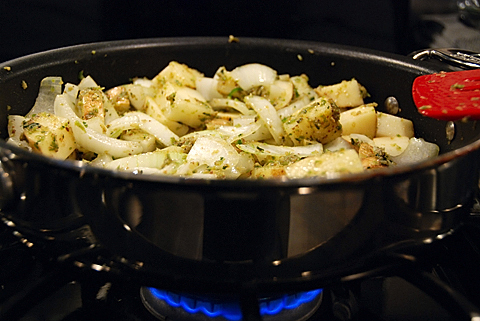 Combine coriander, cumin, fennel, and peppercorns in a small dry skillet, and toast them over medium heat. You don’t want them to burn, so keep shaking them around the pan. They should start to become golden and smell really good. It should take about 2 to 3 minutes. Once they are toasted, remove them from the heat and let them cool, at which point you can use whatever means you have available to grind them to a powder (I used an empty pepper grinder). Set them aside for the moment. 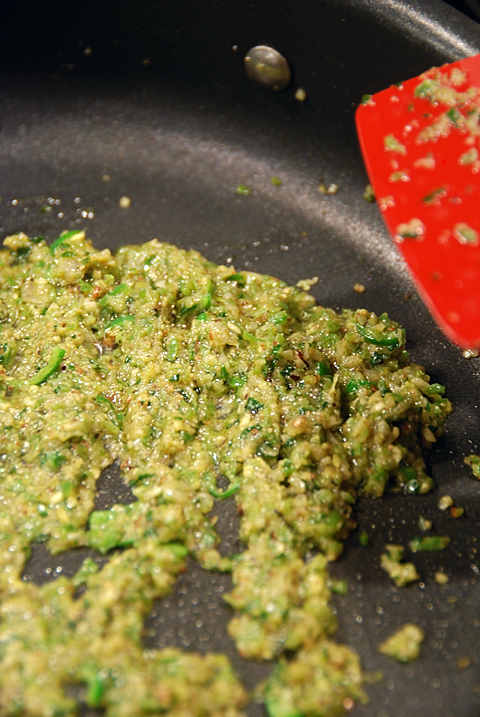 In a food processor or blender, combine the cilantro, ginger, peppers, shallots, garlic, lime zest, and salt. Process/blend that until it is finely chopped, adding some of the oil if you have to in order to get it to move around properly. Then add the spices and the rest of the oil, and process it until well blended. So now with that adventure out of the way, let’s get on to this recipe. Most of the curries I make are based roughly on one recipe, a red curry from Guilty Kitchen. This recipe is significantly different, but I include my initial source anyway because that recipe has always served me well as a general base. If you use a store-bought paste, rather than the one above, you might want to refer to that recipe because mine leaves out some things (oil, cumin, cilantro, etc.) that are already accounted for in my homemade curry paste. So start by preparing your onion and potato, because you are going to need those pretty soon after you start cooking things. I like to make my potato slices fairly small so they cook faster, but you don’t want them too tiny or they’ll be mush by the time everything is done. I didn’t do you the favour of taking a good picture (I’ll do that next time), so you’ll have to just use your judgment. 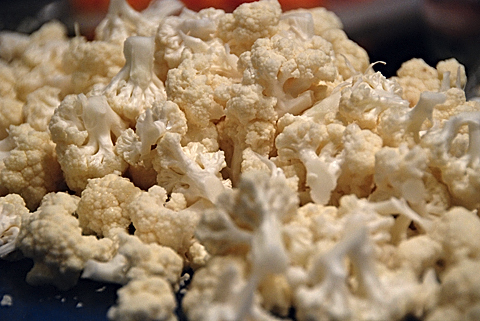 You might want to start on the cauliflower too if you are doing this yourself, because it can take a little time to take apart. When those are done, start cooking the curry paste. 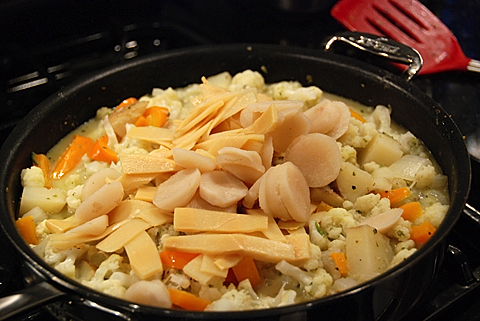 You’ll want a pretty deep skillet or a dutch-oven, because the cauliflower takes up a lot of space. Since the homemade one already has oil in it, you probably don’t need to add any oil to the pan. 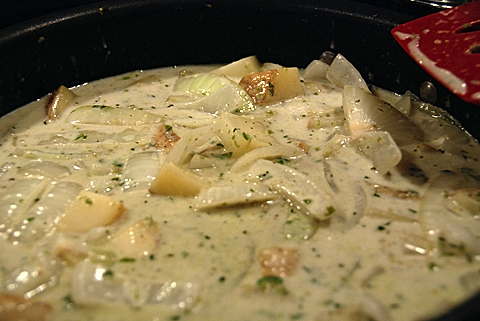 Let that cook on medium-high for a couple minutes, to start releasing the flavors, and then throw in your potatoes and onions. Sauté those for about 10 minutes. I always want to just keep sautéing them without doing anything else because they look so tasty, but then it wouldn’t really be a curry. In those ten minutes, chop up your bell pepper and your cauliflower, if you haven’t already. Once the 10 minutes are up, give the can of coconut milk a good shake, open it up, and pour it on in. Cook this for a few minutes (try 5, but you could go for a little longer if you need more time to chop things up or if your potato pieces are larger than mine). Now you’ve reached the tricky bit. 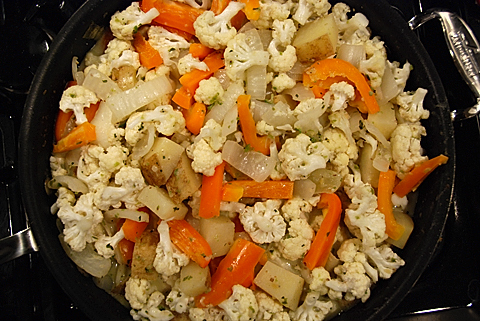 Add the cauliflower, cover (so the cauliflower that isn’t in the liquid steams a bit), and cook on medium for another few minutes (3 to 5), and then throw in the pepper. By tricky I mean you may find, as I did, that you are approaching the limits of your skillet. But don’t worry, it does reduce some. Cover it back up, and cook for 20 to 30 minutes. (Meanwhile wash and cut your water chestnuts and prepare your bamboo shoots.) You might need a little more time than half an hour, but you are done whenever your potatoes are tender all the way through, and your cauliflower is just starting to come apart. It is that softness to it that makes it function somewhat like rice. So somewhere around the last 10 minutes, add the bamboo shoots and the sliced water chestnuts. Just before you serve, throw in the scallions. That is it, and it really doesn’t need to be served with anything. I ground some black pepper over mine, and added a little salt. Enjoy! 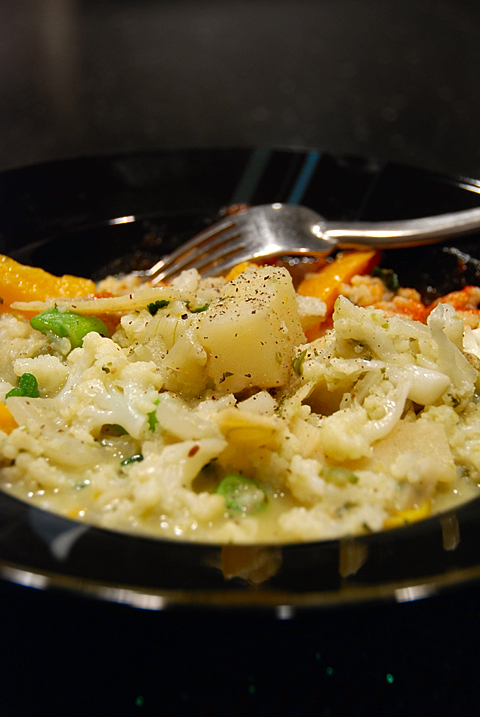 You are currently reading Thai Cauliflower Curry at Nombudsman.